As I have promised in the past to keep you apprised of the situation in our market, as well the economic market conditions these last couple of months, I thought it wise to send out another update to fill you all in, as it pertains to our on going business relationship. Effective December 1 2008 we will be reducing this charge by another 15%. In the last two months we have reduced this charge from $7.70 to $5.95, or a 29% decrease. This is in keeping with the steady decline in our cost for diesel fuel. If the cost of our fuel continues to decline we will adjust the surcharge accordingly. However, it is important to note that we have not seen any relief for the cost of our manifests we must purchase from the provincial government, which continue to cost $14.00 each. Effective December 1st 2008 we will suspend our Premium Energy Rebate until further notice. As you know when we first launched this additional rebate crude oil was at an all time high of about $147.00/barrel. Today crude oil sits at about $50.00/barrel and base oils have seen a drop in price of $.29/L in the last three weeks alone. It is a different world today to say the least! The downward pressure is very intense and we are doing our very best to get the most value out of your used oil, after processing so it can be shared with you (over and above the BCUOMA rebate of $.05/L). The market value for the steel in used oil filters has gone from modest $60.00/ton to no value at all in a very short span. As such will be required to lower the rebate paid on automotive oil filters from $40.00/Drum to $30.00/Drum. This new rebate takes effect December 1, 2008. As well, for your information, we have seen a drop in the value of used plastic oil containers (type 2 plastic) by 72% in the last month alone! In fact we have heard of some recyclers refusing to collect certain types of plastic. IN CONCLUSION We want you to know that everyone at M&R is committed to a partnership with each of you and will be working extra hard to make sure that you receive the best level of customer service and support in the industry. It means the world to all 42 M&R team members that you entrust us to collect and process your hazardous and non hazardous wastes and continue to support a locally owned and operated business. This past Thursday was a proud day for everyone at M&R Environmental. It started at lunchtime when the Burnaby Board of Trade held their ninth annual Hall of Fame Luncheon (Electronic Arts Canada was inducted into the Burnaby Hall of Fame) and finalist nominations for the BURNABY BUSINESS EXCELLENCE AWARDS were as well announced. 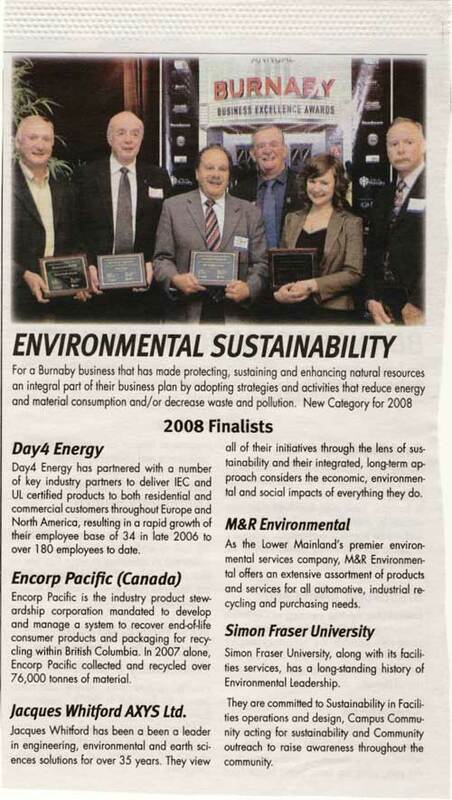 M&R Environmental was nominated in not one but two categories! The first nomination we received was for BUSINESS INNOVATION. Other Burnaby companies nominated for this category were: Day4 Energy, Icron Technologies, Snap Technologies Marketing and Web Tech Wireless. Our second nomination was in the ENVIRONMENTAL SUSTAINABILITY category. The other nominees were: Day4 Energy, SFU Facilities Services, Encorp Pacific Canada and Jacques Whitford AXYS. The Gala dinner is on November 6th 2008 and it is there that the winners will be announced. Our fingers are crossed! Then later in the evening we attended the Business in Vancouver Top 100 Fastest Growing Company Awards at the Vancouver Club. For two years running M&R has found itself not in the top 100 but in the top 50! 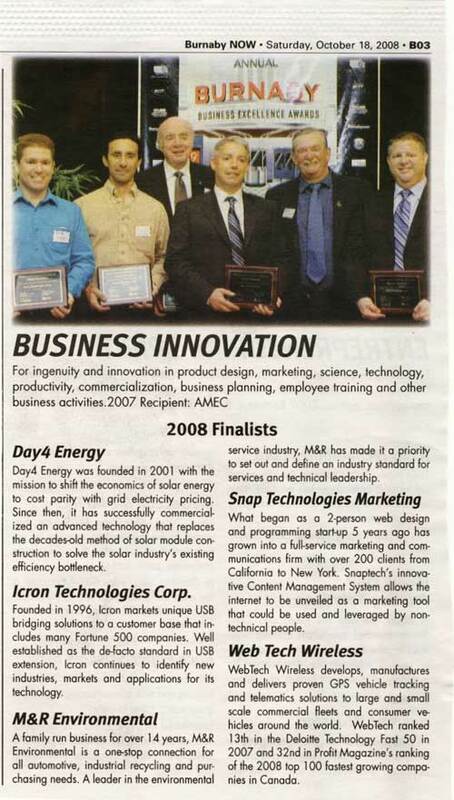 For 2007 we placed 41st. Considering that 60% of the companies that make the list just once do not return, it is quite an achievement to find us on it for two consecutive years. It speaks volumes about our staff and their commitment, as well our customers who continue to support a local family owned business, so thank you all. We’ve all been experiencing the increases related to the cost of crude oil at the gas stations, air travel, grocery stores, natural gas for our homes and our businesses. In fact every part of our lives have been impacted in some way. The overall all energy related pricing steadily going up these last few months has been unprecedented, and we are finding ourselves in ‘unchartered’ waters to say the least. So what does the future hold? Only time will tell but in the meantime as it relates to you and your used oil and its value, well here we have some good news. Effective August 1 2008 M&R Environmental will be implementing a: PREMIUM ENERGY REBATE line to our credit notes, for all of our customers who use our used oil collection service. This will reflect the additional value your used oil has in the market place today. It will be indexed to a combination of the price of base oils and natural gas, today this represents an additional $.03/L. We as well commit to you that this rebate will be reviewed on a monthly basis and that any dramatic changes (both up or down) will be adjusted on your used oil credit note for that month. Should you have any further questions please do not hesitate to contact your M&R representative, or you may call our office and ask for Harold at 604-876-0506. Thank you for the continued support of M&R Environmental, it means the world to us that you trust us to be your service provider. M&R Environmental is pleased to announce that we have concluded a distribution agreement with Link New Tech the makers of the Qwik Draw line of flush machines for Western Canada. M&R will be focused on the Qwik Draw Radiator Flush machines to promote the sales and distribution of the ECO-FREEZ line of coolants but will sell the entire Qwik Draw line of equipment where asked to by our customers. New Link Tech also manufactures and M&R will distribute the following products: Trans Flush, AC Flush, DOC, Power Steering, and NGN, Diesel machines, plus more. These machines save the installer not only labour costs but also will no doubt increase their profitability when performing the various services. Another major draw for us, if you pardon the pun to the Qwik Draw line of radiator flush machines is the 4-chamber heavy-duty machine, which is capable of handling the largest diesel truck engine, something until now has not been available in our market. Link New Tech has been an industry leader and innovator since their inception in 1998 and M&R is very proud to have developed a great working relationship with Adam Awad the founder of New Link Tech and his entire team. The Qwik Draw website can be found on our partners page on this website. M&R Environmental, a leader in the collection and processing of primarily automotive hazardous waste announced today that Amanda Slater has been promoted to the position of Key Accounts Manager. Amanda has been actively involved in the automotive after market industry for more than 4 years, holding progressive roles in customer service and sales management. Originally from Calgary Amanda re-located to the Vancouver area several years ago while working for Pennzoil-Quaker State. Amanda joined M&R in May of 2007. It is with great pleasure that we are also able to announce at this time that Sunny Voigt will be joining the team at M&R in the position of Area Sales Manager. Sunny was previously with Worldpac a wholesale parts distributor where she held the position of Territory Development Manager. Sunny will be assigned to the territory held previously by Amanda. As you may be aware, the GVRD recently implemented a comprehensive landfill ban on a number of materials including many types of rigid plastics. Subsequently, our plastics collection drivers have noticed a significant increase in the amount of other plastic materials, which are being deposited in the bags, which we provide for the collection of used oil and antifreeze 1 & 4 litre bottles. Please be aware that we are only able to collect and recycle 1&4 litre high-density polyethylene bottles (marked no. 2 on the bottom of the bottles), 20 litre plastic pails and carboys, and 205 litre plastic drums. We do not accept shrink-wrap, plastic film or bags, rigid plastic car parts or any other plastic materials. If you have other plastic materials in significant volumes, which you wish to recycle that we do not accept, we encourage you to contact the BC Recycling Council for some referral options. It has been well over two years since we suspended the cost of collecting waste antifreeze. We led the market in this initiative because to run our vacuum distillation unit (s) we required the feedstock (your waste) to create ECO-FREEZ Coolants. What we have found though is that the freeze protection of the waste has been steadily declining to the point where some of the waste is now unusable. Our staff has been monitoring the situation very carefully, and has been testing each drum before collection for the past 2 months, and about 10% of what we are processing is below our requirements. Effective May 1st 2008 should the waste antifreeze we collect from you have a freeze protection of less than –15C there will be a charge of $35.00 per drum. In many cases if your waste antifreeze drum is uncovered outside, by simply covering the top or bringing it indoors (the best option) the freeze protection increases past our requirements. The dilution is due to the amount of rain we receive, the drum(s) being uncovered outside, and this water getting inside the drum. We have seen an upswing in the various municipalities Fire Marshall(s) inspection activity particularly in relation to the storage of your used oil in non-self contained units (mainly old furnace oil tanks and 205L drums). We have sourced out a company in the U.S. who builds self contained plastic tanks that range in size from 450 Litres up to 1900 Litres at the most reasonable pricing we have seen. If you are interested please contact the office and we can have one of our Area Sales Managers provide you a quote. You may even be eligible to use your rebates towards the purchase. First of all, thank you for your continued support of M&R Environmental. You are our most important asset and we appreciate the opportunity to be your environmental services provider. As we move into 2008, I want to tell you about some of the things going on at M&R that will enhance the value that we deliver to your organization every day. When I started at M&R in 2004, I saw a marketplace with still boundless potential. M&R was a company created by George and Dani Mate in 1994, childhood friends of mine, who literally created a new service for the marketplace by diverting used plastic oil containers from our landfill(s). And today with 14 years having gone by, I’m here to tell you we have only began to scratch at the surface of realizing our potential. So, what’s new? Simply put, it’s a new day at M&R. We are an evolving company, with our services; our products and our brand, developing further to once again define and set the industry standard for excellence in the environmental management business in our trading area. We have been a very busy organization. We are investing at record levels - over $1 million dollars through 2008 into virtually every facet of our business, all with an eye toward making our offering, customer service and brand truly world class. We have reviewed what we do, what we stand for, how we act and what value we provide with the singular goal of making ourselves an even better, more customer-driven company. Our transformation began with you. We listened to our customers - large and small- through our ongoing Customer Satisfaction Survey. And we listened with open ears and an open mind. We heard your praise, and yes, some criticism. In the coming days our second vacuum distillation unit for recycling of waste antifreeze will be producing twice as many litres of ECO-FREEZ as our initial unit. This will triple our capacity and give us the ability to meet the market demand.We are years ahead in our growth plan for this product. We have installed a state of the art liquid-liquid centrifuge, which will provide our employee’s more safety, and a better finished glycol product for our customers. We will be rolling out to the market in the coming weeks a unique system that provides a fast and profitable means to increase your radiator flush business, for both automotive and heavy duty vehicles. We have added to our offering the complete Enpac spill containment product line. All of our company service vehicles have a GPS system installed. That way we know where each service vehicle is at any given moment so we can better serve you. As well Dr. Rahmat Vefghi PhD our Vice President, with his +20 years of expertise, not only handles our company’s environmental and regulatory affairs, He is available to guide any M&R customer with their regulatory affairs at no cost. You will find a more nimble organization to serve your needs. Our already great computer system has been up upgraded, and if I can be completely honest; it gives you more timely data than anything the government can provide in terms of tracking the movement of your hazardous waste and corresponding manifest number(s). Virtually all aspects of our operation have been reviewed with an eye toward customer service and operational improvement. We continue to make significant investments; our goal is to continue to be, bar none, the standard in the industry. The customer support team will continue to communicate our value added approach so that you may benefit from our full circle service. Understanding that this all begins from within, we have clearly stated both our corporate values (how we act) and our promise to our customer (what we do) to ensure that you will be even more satisfied with us.Our mission statement, environmental policy, and corporate values can be viewed at: www.mrenviro.com or www.eco-freez.com. I welcome your feedback. In closing, we will settle for nothing less than world-class products and services. You will see and experience the changes described above when you call or visit us at our facility in Burnaby. My intent is to communicate with you during the year as we continue to make progress. 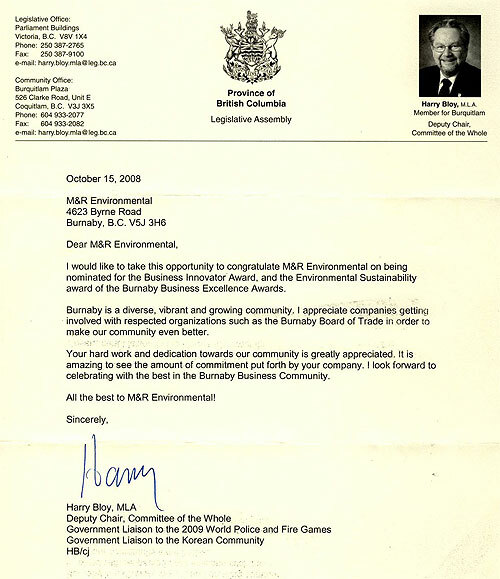 I look forward to working with you and serving more of your environmental needs through 2008 and beyond. 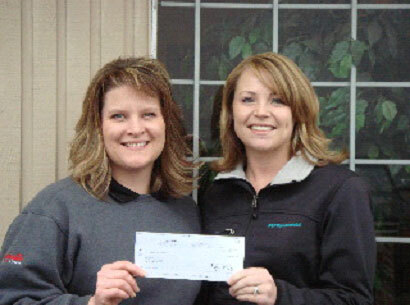 Amanda Slater, a Area Sales Manager for M&R Environmental presents a cheque for $1000.00 to M&R’s Customer Satisfaction Survey contest winner Kathy Mehrer, the Service Manager for Arvid’s Automotive in Abbotsford BC.